[SatNews] Loctronix® Corporation has initiated shipments of its new software-defined radio (SDR) module, the ASR-2300, for developing high-performance positioning, navigation and timing (PNT), and communication applications. “The ASR-2300 delivers advanced SDR capabilities in a small, mobile form-factor enabling developers to readily create and field complex SDR-based solutions. Featuring a 2x2 multiple-input, multiple-output (MIMO) RF transceiver and an array of inertial sensors, the open-source ASR-2300 is an ideal platform for tapping advanced, multi-sensor/signals of opportunity for high-performance PNT,” stated Michael Mathews, Loctronix’ CEO and founder. “Unique amongst the growing number of SDRs, Loctronix’ ASR-2300 provides multiple, fully-integrated RF paths supporting reception of GNSS, cellular, ISM band, and UHF signals of opportunity, making it well-suited for demanding scientific, military, aerospace and commercial/industrial applications, such as UAV/UAS navigation, GPS-challenged or -denied tracking and navigation, combined communications and navigation radios, and GPS integrity monitoring and validation,” Mathews noted. The versatile MIMO transceiver module incorporates two wideband Field Programmable RF (FPRF) transceivers (300 MHz to 3.8 GHz), 10-axis accelerometer/gyro/compass/barometer sensors, and a large programmable FPGA capable of over 300MiB/sec sustained communications with a host processor via USB 3.0 interface. The module’s nine integrated RF path options and low size, weight, and power characteristics contribute to ease of integration and portability. Accommodating both internal 1 PPM TCXO or external frequency reference, multiple ASR-2300s can be inter-connected via an expansion port and/or UART interface, supporting real-time reception / transmission of 4, 6, 8 or more signals without the need for significant additional hardware. Developers looking to create solutions for demanding military, scientific and industrial applications will realize greater functionality with the ASR-2300, thanks to its multiple sensor and multiple frequency capabilities. Additionally, access to a variety of user-friendly development tools facilitates waveform experimentation and helps speed the creation of these new solutions, resulting in shorter development times and lower development costs for high-performance PNT applications. Bundled kits, which include the module, housing, and power/data communications/RF interfaces, are priced at $1,600 with a special educational discount available for qualified institutions. 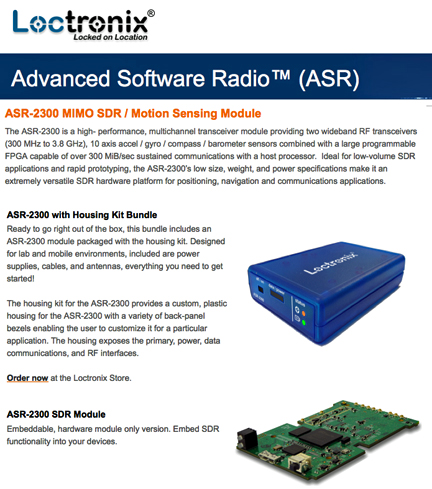 The ASR-2300 SDR is available directly from Loctronix.